The eleventh pattern in Miss Lambert’s My Knitting Book (1843, First Series, pp22-23) is for a Brioche. 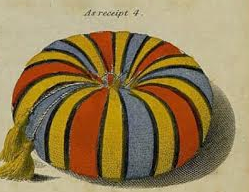 As a footnote to the pattern, Miss Lambert notes that it is: “So called from its resemblance, in shape, to the well known French cake of that name.” The pattern doesn’t say what a knitted brioche actually is, but based on the instructions, it seems to be some kind of cushion or decorative pillow. It is knit using the brioche stitch. A knitted brioche was a decorative pillow meant for the parlor. Patterns for these pillows were popular in knitting magazines between 1840 and 1875. 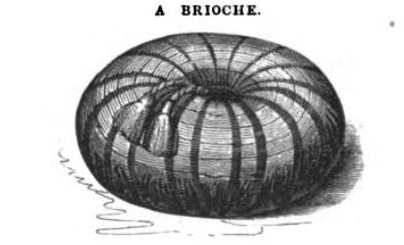 In other publications, a knitted brioche was also known as a Moorish Brioche or a Turkish Brioche or cushion. Mrs Gaugain also provides a full page of details (it is a little intimidating, I might add!) on how to assemble the completed Brioche which I will likely need to reference upon completion of the knitted portion of the project. So now that I have some idea of where this pattern will lead me, it is time to take a look at the pattern in detail and figure out what needles and yarn I will need to use. This sounds like it will be an interesting project to make. I think I’ve seen those sorts of pillows in older detective movies. I can’t wait to see what you come up with using the pattern.